Here is something every Serious Z Enthusiast should be a part of! Is there anywhere I can download or watch this race? I want to do this soon! Thank you so much for doing this! I really appriciate it! I just heard about this from Tony Adamowicz last week. I wish i could watch the race tomorrow, but I will be racing myself. Please, for the love of God, record the race and post it to youtube or send it to me! PLEASE!!!! Aluminum is weak and gets damaged easier than steel in my experience. The pressure plate bolts got ripped out of the Aluminum when I was autocrossing my Z. I actually Prefer chromoly, or a heavier flywheel. It makes more torque! Faster up hills! I just installed the Semi-Solid Urethane mounts in my mildly built 240z. It is tuned at 140 hp to the wheels with the l24, Cam, high compression head, headers, and SU carbs. 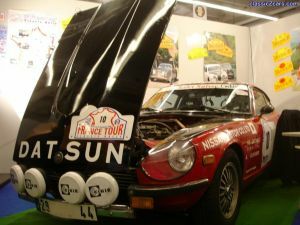 It was rebuilt and able to withstand high RPM's, 7,000-8,000 range. I primarily use this car for Autocross, Gymkhana, Off-road Rally Racing that is Sanctioned by San Diego Club Racing and it is comfortable and reliable enough to drive to work. I drive Highland Vally Road (an extremely tight & winding mountain road) every day to work, so I tear apart stock mounts and go through sets of tires and brakes every 3-5 months on average. I have been looking for a set of Urethane mounts for my car for many years, I got tired of braking and replacing stock sets. I know it's time to get new mounts when my engine hits the strut tower brace. I have gone through 4 sets already and was just fed up with the hassle and wanted something permanent that I didn't have to worry about. I am also planning a high HP l-28, (400hp to the wheels..) But I was held back because there wasn't an easy solution for this problem. (I am breaking mounts with a stock motor!) When I saw the new urethane racing mounts I felt inner peace! Now there is a set of urethane mounts for the l-series thanks to Mckinney Motorsports! Call now and get a set, Don't waste your time with the stock mounts! Ask For Mack! Mckinney Motorsports Website Phone: 951-304-9300 morepower@mckinneymotorsports.com The installation went smooth without a hitch, Really easy to install! Took about an hour with basic hand tools and a jack to lift the engine, no need to raise the car on jack stands. They look really cool in the engine bay, very beefy, thick and strong and have very little vibration. I was expecting more shaking and resonating but was very pleasantly surprised that it has a near stock comfort level for a urethane mount. I noticed an increase in throttle response, when shifting and rev-matching and heel toe, I am able to chirp the tires in 2nd gear, I wasn't able to do that before. The mounts have very little movement compared to the stock mounts. Thank you Big Mack for developing these Urethane L-series engine mounts! Keep working on the matching transmission mount! 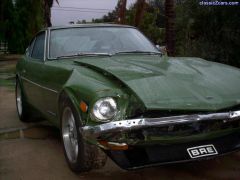 i bought 240z with rear bilsteins the greenish yellow, but the fronts were not. they have thick shock shafts, unlike the tokico and kyb's. I'm thinking of using them if i can find a pair of used front tokico's. Thanks for all the comments and suggestions! I don't have photoshop so I can't take the truck out, I wanted to though! I sure hope I win! That would be so cool! Sorry, I am not mentioning names, unless I have to, I am protective of her privacy. Trust me, she gets enough trouble from the guys without me adding to it. She is a "good girl", stays out of trouble and I respect her for that choice! Thanks again and I appriciate every vote (so does my friend)! my z is fixed man! ! thanks anyways! I sold my t-bird and saved money for a year to fix her! 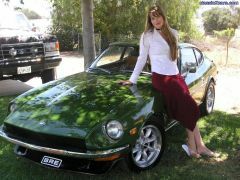 I am not sure, all i know is that my 73 240z is all stock with the origonal engine. I'll check tomorrow when i have some light. This is what happens when you lag on a rear brake job. Left rear cylinder failed, r/h rear wheel locked up at over 110mph on the 78 mountian pass one year ago; 100 mph tagged a guard rail going sideways. I now have Toyota calipers with vented rotors up front, and 240sx calipers and disks in rear. All SS lines, and high volume master cylinder with dot4. I am broke. don't be dumb like me. Only if I get a free issue!! !